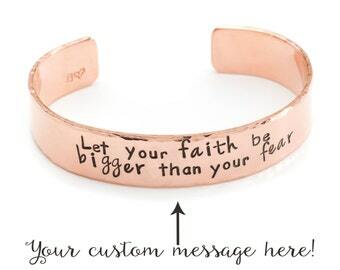 A custom gold brass cuff bracelet, hand stamped with your personalized message or name and made just for you. 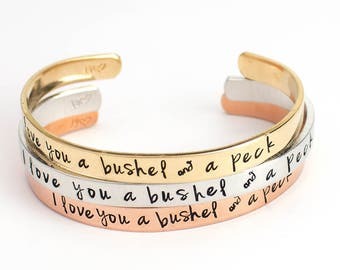 This hand stamped brass cuff is 14 gauge in thickness! It comes in either a polished finish (2nd picture) or brushed (1st picture). You can have the words darkened or left natural. 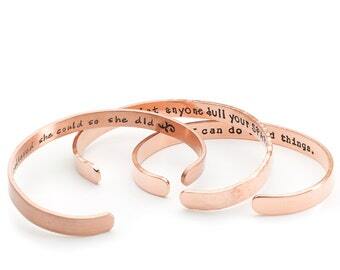 L - fits wrist sizes 7 3/4" to 9"
I can fit up to 40 characters (not words) on each side. Comes in a gift box with ribbon. 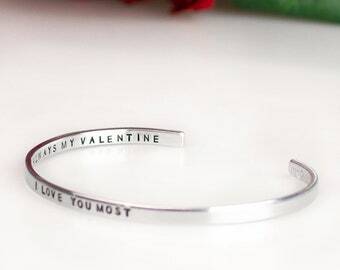 Hand stamped to order, production times apply. 1. Choose your size and sides that you would like stamped in the drop down menu. 2. Choose your font choice in the drop down menu. 3. 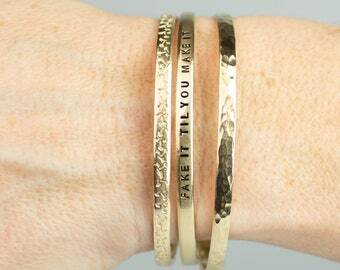 What you would like stamped. Be VERY careful, and double check what you enter, as I will stamp it EXACTLY as it has been typed out in the notes. 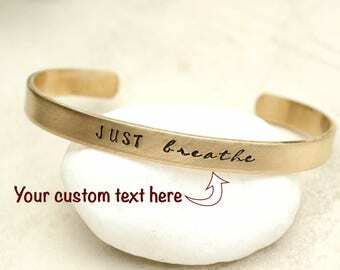 If you'd like a mix of fonts, as in the first picture, that is perfectly fine, just let me know in the notes to seller. 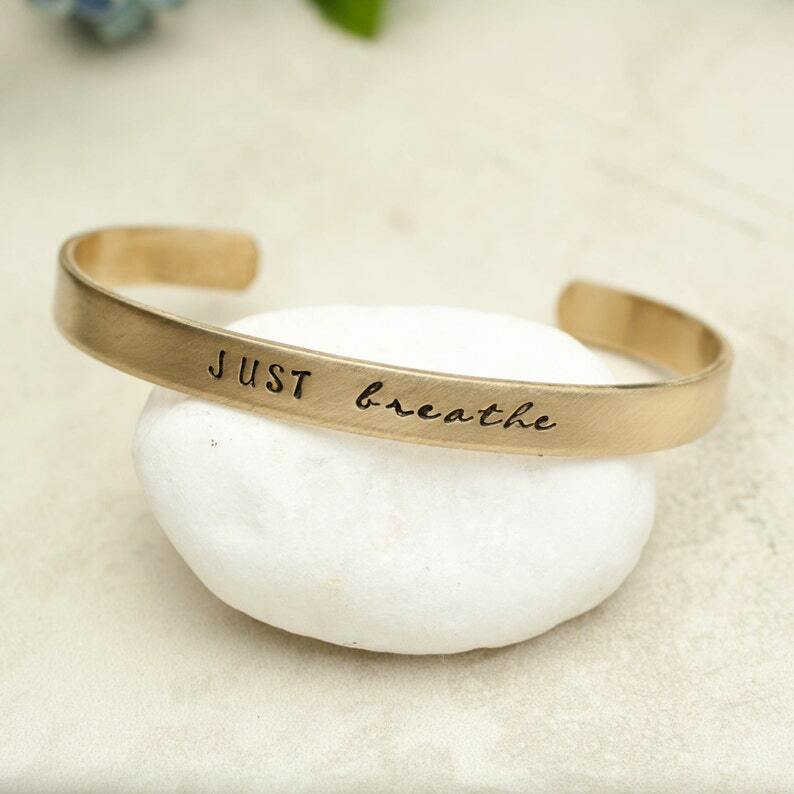 This is a one of a kind, hand stamped item, so perfection is not guaranteed (or desired)! 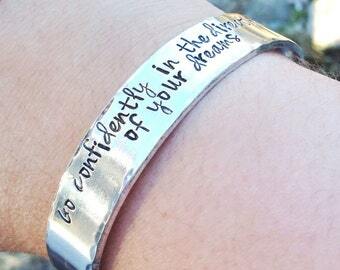 There may be slight variations in spacing or alignment, but that is the "charm" of a hand stamped piece! Some people are sensitive to brass, and it can cause their skin to change color and the metal to tarnish. An easy way to prevent this is to apply clear nail polish (not top coat, but actual polish) to the piece. It will create a barrier between the skin and the metal. Brass also will darken over time, this is completely natural and most people like this look. If you want to try to keep it the original bright color, use the polishing pad that came with your order. ♥ ♥ Please note that I cannot except returns on custom items. Your item will be wrapped in our signature blue and cream paper with red ribbon, and a gift card. Mother's Day Sale! Save 20% off everything in our shop. Due to this sale, no quantity discounts are available during this time; everyone receives 20% off. This bracelet came out amazing and my partner loved it! Custom and personalized orders must be submitted through the website, and all personalization must be sent to us in writing. Please make sure you review and check what you send, as we cannot change or "fix" a piece once it has been stamped. 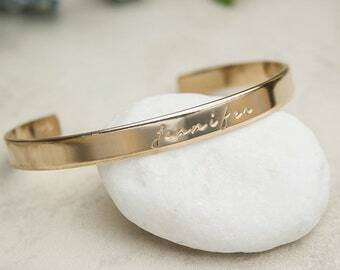 If the customer has made a mistake when submitting their personalization, they will need to purchase a new item if they wish to have the text corrected. You can find sizes in the description of each item. If you have a question about size, please contact me before ordering, I would be happy to help. Sterling silver, brass and copper do tarnish if not worn continuously, so I include a polishing pad with those items to keep them clean. When not being worn, they should be stored in a zip-top style bag with all the air squished out. Aluminum does not tarnish, and therefore does not require a polishing pad. To clean your aluminum pieces, dampen a soft cloth and wipe clean, then dry thoroughly. Since my items are handmade and not coated with any finishes, they should not be worn when showering or swimming. Please note that certain perfumes, lotions and medications may cause a reaction with your skin and the metal - please check to make sure you do not have an allergy to any metals you may be ordering before placing the order. 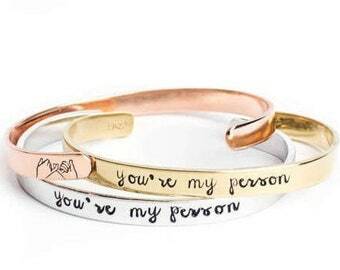 Jessie Girl Jewelry does offer a wholesale collection, please contact us for details. My production times vary depending on the time of year. Please see the shop announcement at the top of my shop for the most current production time. Shipping times are additional, they are not included in my production times. For first class mail it can take up to 5 business days for shipping. Priority mail takes 2 to 3 business days, and Express mail takes 1 to 2 business days. International shipping times vary and cannot be guaranteed. 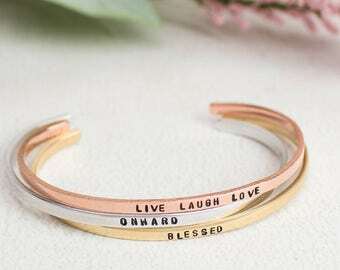 Jessie Girl Jewelry is not responsible for packages that have been marked delivered by the post office but have not been received by the recipient. In the case where your package has been marked delivered, please contact your local post office. 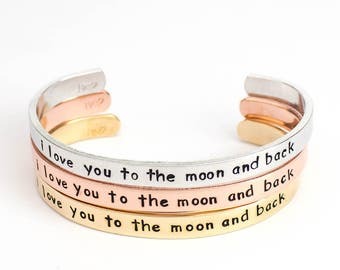 Once marked delivered, Jessie Girl Jewelry does not offer replacement shipments for packages, but we can offer a discount off a new order if the customer wishes to reorder the item.